Download BarChart.zip which includes: BarChart.ahk, examples, Gdip.ahk, screenshots. Short documentation and license are in BarChart.ahk's comments. Learn from examples. My God. I've not had time to check it out yet, but damn it looks good! EDIT: After trying it out... Fantastic! These are VERY well done! I applaud you for a clean code, simple to use, good visuals. Very nice! 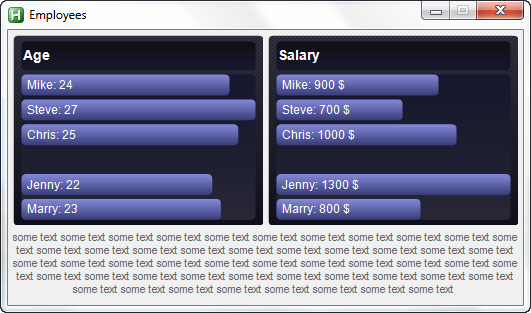 The newest update (which was finished 2 months ago but not released yet because of www.autohotkey.net problems) has example which demostrates vertical bar charts - column charts. You can already do it with the current version by using Gdip_RotateBitmap() function which I posted in Tic's GDI+ lib thread. Maybe I'll do it once... Multi lines in one chart should be supported too. Very awesome script! Great job. BarChart updated: simplified usage, new possibilities, new examples. This is phenomenal!! I'm really liking the "DarkT" skin. Quick question for you.. without changing the bars, would it be possible to change the age "27" to "Oldest".. and age "22" to "Youngest". Any quick way to hide the actual numbers and just have bars and text? Another really "minor" adjustment that could be made is if there are negative values, the fade might look abit more symmetrical if it went the other way?? or was this your preference? This is awesome! I report on a lot of data and frequently graph it in Excel. This opens up the possibility of doing it all in AutoHotKey! 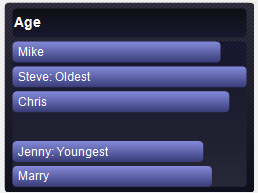 without changing the bars, would it be possible to change the age "27" to "Oldest".. and age "22" to "Youngest". Such feature is not built in BarChart. What you could do is to create BarChar bitmap - pBitmap := BarChart(), than get Gdip_GraphicsFromImage(), and than overwrite part of bar where "27 & 22" are written; first with rectangle - Gdip_FillRoundedRectangle() or Gdip_FillRectangle, and than write Gdip_TextToGraphics(). Any quick way to hide the actual numbers and just have bars and text? Yes. Add DisplayValues:0 in the Options parameter. if there are negative values, the fade might look abit more symmetrical if it went the other way? Perfect, this is what I was looking for! 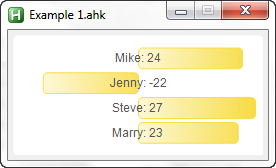 If you set DisplayValues := 0, then you could store the names and alter any text subsequent which is what I desired. Thanks! Ha! You know how to use BarChart() better than me! Respect! 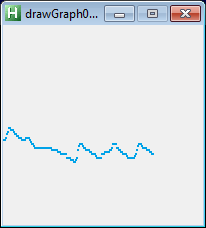 I was looking for a way to create a graph in Excel, then show it as a GUI. Please check out my script Excel Charts, if you have time!